Matteo Zema opened the first wine bar/tavern in Armo, Reggio Calabria in 1835, much to the angst of the local authorities at the time. Although the tavern no longer exists, it was this legacy and a passion for wine that has been passed down from generation to generation. 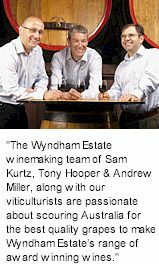 After migrating to Australia, Nicola Zema started working for Wynns in 1953, hand pruning, picking and planting, a job that continued through until his retirement in 1975. Filippo and Maria Casella emigrated to Australia bringing with them their know-how acquired through three generations of grape-growing and winemaking in Italy. 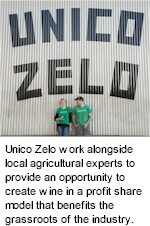 Recognising the potential of the region, Filippo purchased a farm in the town of Yenda, New South Wales. After selling the grapes from his farm to local wineries, he decided in 1969 that it was time for a new generation to put its winemaking skills to use, and the winery was born. It is a story about new beginnings, a story about a young couple, with a young family, forging their own path within a wine region as first generation winegrowers. While not locals, there is a saying in the Barossa that you have to have a grand-parent in the ground before you are considered a local, Susan Yelland and Michael Papps call the Barossa home and are as passionate as any sixth-generation Barossan about the region, its vines and its history and its characters. 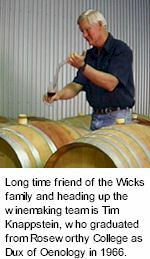 Michael has lived in the Barossa for the past 20 years, working in the wine industry in a number of sectors from winery work to bottling lines and wife Susan, moved to the Barossa in 1999 from the Yorke Peninsula after time spent in Adelaide and New York studying at the Windows of the World wine school. 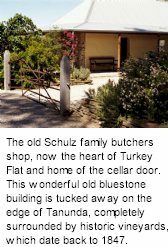 Today Michael and Susan own a five acre property on the valley floor out side of Nuriootpa and have two young children, Peyton and Campbell. 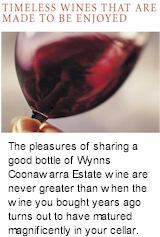 English immigrant George Wyndham began this most important page in Australia's winemaking history in 1828 when he planted his first vineyard at Dalwood, along the banks of the Hunter River, in New South Wales. 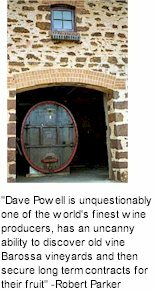 Seven years later Dalwood Wines, as it was then known, released its first vintage to rave reviews and by the mid-1800s was exporting to England and India. 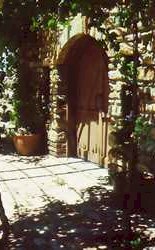 Wrattonbully Vineyards is an Estate established by the Hill Smith family in 1994. 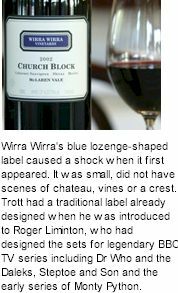 It is sited in the recently discovered region of Wrattonbully, a near-northern neighbour of Coonawarra within South Australia’s Limestone Coast. 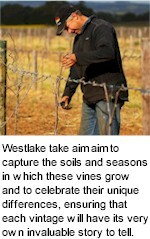 The vineyard site was chosen for its soil types (principally shallow red soils over limestone), undulating aspect and coolish, reliable climate. Like the other settlers, Johann established a mixed farm of sheep, cows, crops and fruit trees as well as a few grape vines along the alluvial banks of the Para River. 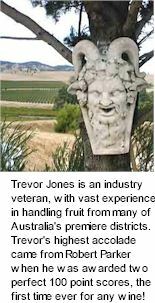 This northern Barossa location is distinguished by its cooling gully breezes during vintage, providing slow ripening and a clearer expression of berry and spice flavours in red wines and lifted varietal fruit characters in whites. 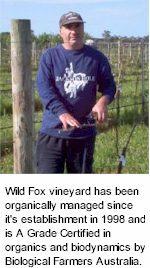 Established 1998 on Gawler River west of the Barossa Valley, Wild Fox vineyard has been true to the best biodynamic and organic farming practices to produce quality natural wine grapes to make award winning wines. All for the pleasure of the fine wine connoisseur and especially for those with allergies and or indifference to additives. It all began 70 years ago in the village known as Agrelopo, on the historic island of Chios Greece, where they farmed in tune with the cycles of the sun and the moon, coaxing the seasons, to achieve the ultimate nutrition in their produce from the soil, the sun and the rain. 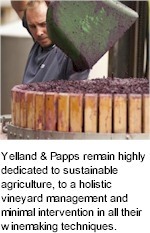 Biological farming is a phrase to describe biodynamic and organic farming. Both use innovative, non-chemical techniques for farming in harmony with the environment and providing nutrient rich, healthy soils from which healthy produce is grown. Warburn Estate is located near Griffith in New South Wales, in the centre of the large Riverina grape-growing and agricultural region. Warburn Estate is one of New South Wales most significant wine producers with more than 1000 hectares under vine, a crush capacity of 40,000 tonnes, tank storage for 35 million litres of wine and an annual turnover of $40 million. Warburn Estate proudly remains a private company, maintaining its winemaking independence with the ability to quickly respond to market demands and client needs. 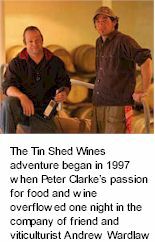 The company (formerly Riverina Wines Pty Ltd), is owned by the Sergi family, whose winemaking traditions began in Italy many years ago. Migrants Giuseppe and his son Antonio began to grow grapes on their farm and making wines for his family and friends using old barrels and hand made machinery. He would often sell bulk wine in 200 litre drums, a practice common in Italian cantinas, and would travel extensively throughout Australia to supply his customers. 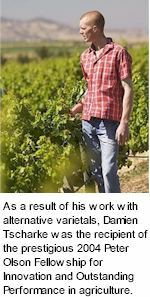 Damien is a sixth generation vigneron and Roseworthy honours graduate. 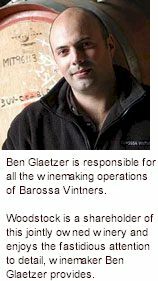 Damien is also the proprietor and winemaker for the acclaimed wines produced under the Glaymond brand, which was established in 2001. 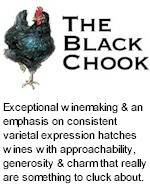 His vision to explore and develop alternative varietals in the Barossa Valley led to the establishment of the Tscharke brand in 2004. Having worked on his family's vineyards for over 15 years he has developed an intimate knowledge of the vineyard sites and sub appellations of Marananga and Seppeltsfield in the Barossa Valley.